Some heart rhythm disorders occur infrequently during certain activities, such as sleeping or physical exertion only. Using CardioMera Holter monitor increases the chance of capturing the cause of daily occurring cardiac problems. 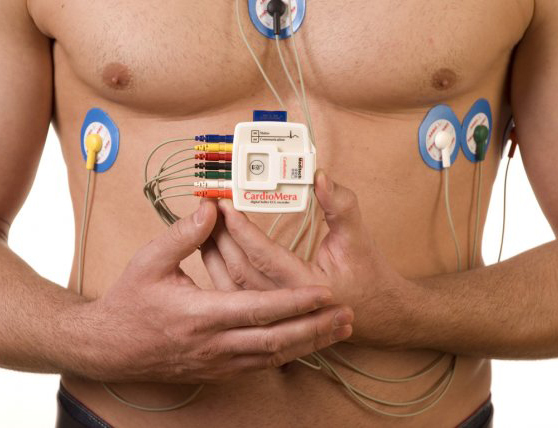 Why to Choose CardioMera Holter Monitor? The verified Meditech algorithm identifies ~ 100% of recorded QRS waves. CardioMera Holter monitor allows for 1, 2, 3 and 5-channel monitoring, although a 2-channel monitoring is sufficient to identify ECG abnormalities in 95% of all cases. CardioMera Holter monitor software can detect pause, missing beat, ventricular and atrial fibrillation, bradycardia, tachycardia, arrhythmia, R on T, QT, ST elevation and depression, minimum and maximum ST, HR, QT, SA and AV block, T-wave alternates and many other events automatically. Freely customizable morphology limits, freely editable and printable reports. Automatic ECG recordings can be scanned and edited quickly by the innovative Meditech run ECG function. Simple and quick function keys for better RR, HR and beat type overview. Colour-coded ECG channels for better identification. CardioMera Holter monitor software offers a drop-down list for ECG events, HRV, ST and pacemaker statistics and for QT and PQ analysis. 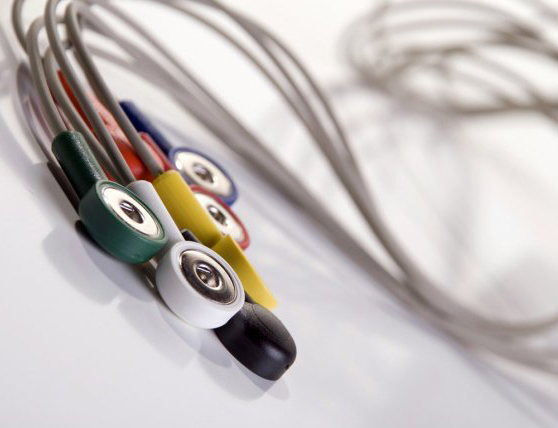 Save money with easily replaceable CardioMera Holter monitor patient cables. 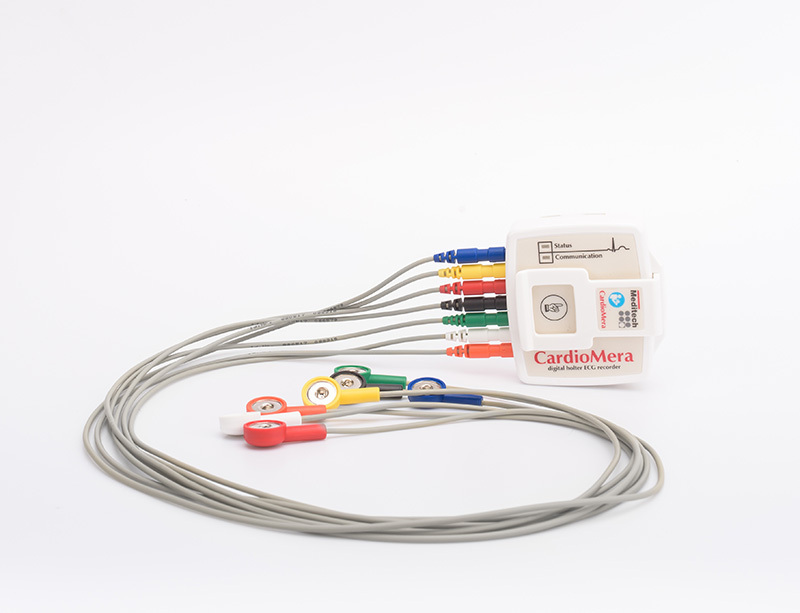 Unlike many competitor products which have an inbuilt patient ECG cable set, CardioMera offers single, easily replaceable ECG electrodes. CardioMera Holter monitor offers 5in1, all-inclusive software package, which includes beat-by-beat ECG annotation, time and frequency domain HRV, pacemaker identification and QT dispersion software features with the possibility of manual alterations of automatically recorded ECG. ST, HR, RR statistics, run ECG for retrospective ECG scanning, trends and histograms are also available. 1 x ECG Holter recorder unit, 1 x memory card, 1 x AAA alkaline battery, 1 x USB optical interface, 1 x 7 lead patient ECG cable, 1 x package of disposable ECG electrodes, 1 x CD with the latest software and user documentation, 1 x quality certificate packed in black protecting case. A card-reader unit is necessary for reading data! The interface cable and the CD may be excluded from the kit for additional discount.